It isn’t uncommon for people to discover allergies when introduced to new drugs. 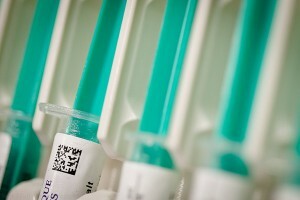 There are a few different drug tests doctors can do to determine the source of the problem. Skin Tests – In some cases, including specific antibiotics, skin tests can be performed to figure out if you’re allergic. This test is performed by injecting a small amount of a drug into the skin on your back or forearm. Should you develop a raised bump or a red rash, it’s safe to assume you’re allergic to that drug. Blood tests – Only a few drug allergies, like insulin, muscle relaxants, and a few antibiotics, can be discovered through blood tests. However, these tests aren’t preferred over skin tests, as skin tests are much more accurate. Physical exams – Paired with questions about medication and symptoms, a physical exam will help the doctor get a better idea about the allergy. Provocation tests – If blood or skin tests are not conclusive, a provocation test can be administered. This type of testing includes gradually increasing doses of a drug while watching for any reactions. This is a rare test that is usually performed only in specialized allergy centers as its risks include possible anaphylaxis and a severe reaction.